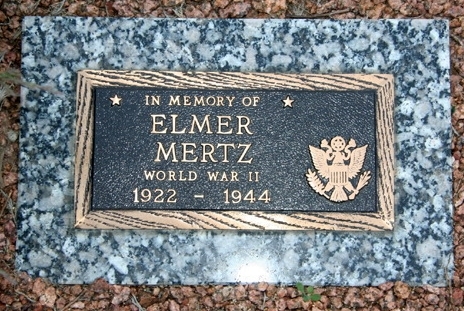 Elmer A. Mertz was born in Sheboygan, Wisconsin on May 17, 1922. A graduate of Central High School, Mertz was a star infielder on Sheboygan's Gmach softball team (city champions in 1941) while working for the Miehle Printing and Manufacturing company. Prior to entering military service in May 1943, Mertz was employed in Chicago as an assembler on anti-aircraft guns. In August 1943 he earned a medal of marksmanship in rifle shooting for his accuracy on the range at the West Coast Ordnance training center at Camp Santa Ana, California. In October 1943, he volunteered to join the ski troops at Camp Hale in Colorado, and then volunteered for paratrooper service, earning his paratrooper wings in late 1943, and serving with the 508th Parachute Infantry Regiment, 82nd Airborne Division. Private Elmer Mertz was posted overseas in March 1944 and transferred from an 82nd Airborne Replacement Depot to Company E of the 508th on 31 March 1944. Based in Nottingham, England, he had the chance to play one last ball game before going into combat. On Sunday, May 28, 1944, an enthusiastic crowd of 7,000 fans gathered at Meadow Lane soccer ground to see the 508th Red Devils play an exhibition game against the locally based 505th PIR Panthers. The Panthers were no match for the Red Devils, losing 18-0. Eight days later, as night fell on June 5th, Mertz and the men of the 508th - faces blackened and hearts racing - boarded transport planes for the flight across the English Channel. That night over France, 24,000 Allied paratroopers ascended through the darkness into chaos and confusion. Inexperienced pilots failed to locate designated drop zones and whole regiments landed miles from intended locations. Private Mertz survived that chaotic first day but was killed in action a week later, on June 13, 1944. He was originally buried at Blosville Cemetery in Normandy, France. His body was returned to Sheboygan in May 1948, and now rests at the Greenlawn Memorial Park. Thanks to Dave Berry at www.pathfinderhistoricalconsultants.com for help with this biography.